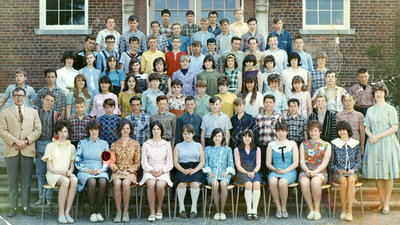 Colour photograph showing the grade 8 class at Brooklin Senior Public School. Back row: Harry Agar, Jim Wilson, Ben Acton, Ron Snudden. 6th row: Gary Mason, unidentified, Will Kennedy, Tim Colleran, Bill Down, Neil Duff, Neil Henderson, Jack Forde. 5th row: ___ Batty, Wayne Curl, Don Wilson, Lloyd Pearson, Paul Bradley, Ron Tiemes, Brian Forder, _____, Neil Bowden, Don Bailey, Gary Reynolds. 4th row: Connie Simpson, unidentified, unidentified, Yvonne Kirkwood, unidentified, Debbie Bagg, ___ Wagner, Bonnie Middleton, Maryanne Milner, Jane Hamer, ____ Batty, Connie Nesbitt. 3rd row: Bruce Miller, unidentified, Lena Lent, Debbie Gadyk, Jane Grant, Wanda Bowers, Mina Thompson, Carol Crawford, unidentified, Erna Tiemes, Karen Murphy, Lynda Hodson, Keith Schell, unidentified. 2nd row: Mr. Gatfield, Ken Knight, Bill Vipond, Murray Peacock, Brian Dingman, unidentified, Glen Bryson, Paul McLellan, Richard Clark, Ron Batty, Terry Shankland, Darrell Long, John Zylstra, Mrs. Kyte. Front row: Linda Kydd, Linda Batty, Elaine Alderson, Wendy Ellis, Janet Gilbert, unidentified, Nancy Thompson, Nancy Mitchell, Carolyn Mitchell, Jennifer Bailey. Brooklin Senior Public School Grade 8 Class, 1966, unknown photographer, Whitby Archives, 25-000-336.